After spending a part of my evening watching a re-run of Design Star season finale and an episode of Junk Gypsies I had yet to see, I felt inspired…to take a shower! I do my best plotting, er, planning in the shower! Once my pin curls were set I was off to organize my craft closet! I had two main goals for this particular purge. 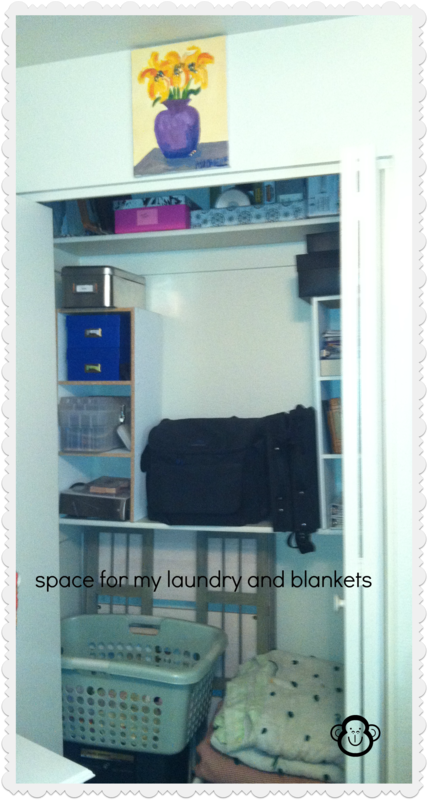 One was to have an area to store the winter blankets and to store my laundry basket. As you can see from the before picture, it was stuffed full. I purged, a lot. By the end of it I had 5 pounds worth of trash, one full paper recycling bin, and 5 bags for donations. I cleared out old paperwork from my past hobby, projects that I haven’t touched since 2007 and was left with a pretty, clean closet! This was the only goal for July…it’s too hot to do anything outside!! I have the best revelations while taking a shower. It’s almost as good as those amazing thoughts in between asleep and awake. Thank you! It always feels so good to get rid of all the junk!